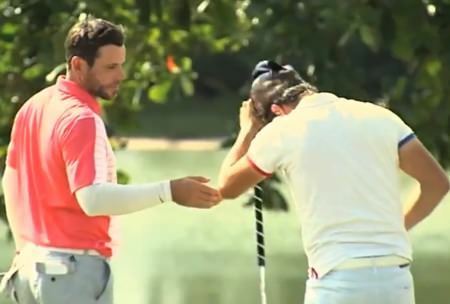 The pair opened with three under 68s to share fifth place behind French pair Matthieu Bey and Sebastien Gors and Italy’s Alessio Bruschi at Golf International de Saint-Francois Guadeloupe with Richard Kilpatrick tied for 31st after a two over 73. McCarroll had four birdies and one bogey in his round while Grant, who won pro-am (pictured) had five birdies and two bogeys. Brendan McCarroll shrugged off a neck injury to remain on the fringes of contention but Stephen Grant lost focus after a lightning start and missed the cut on the Alps Tour in Spain. Golf in Guadeloupe. Stephen Grant and Brendan McCarroll are just a shot off the lead entering today’s final round of the Open de Saint Francois - Region Guadeloupe on the Alps Tour. "Changing equipment is always tough, no matter what anyone says"